Australian container supply chains could be set to change after the first call of an 8,000 teu-plus vessel at the port of Melbourne as carriers seek to capitalise on soaring Asia-Australasia demand. 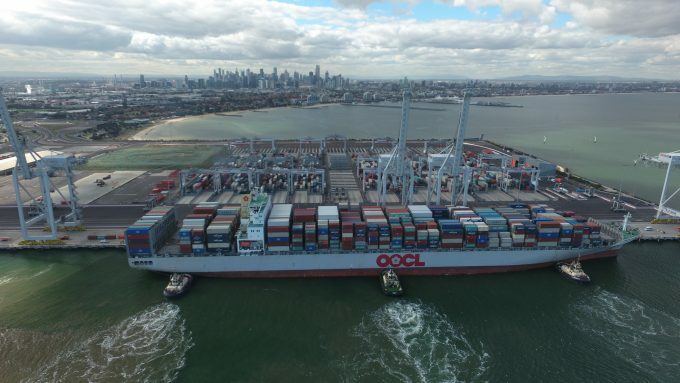 Melbourne’s ICTSI-operated Victoria International Container Terminal (IVICT) last week handled the 8,063 teu OOCL Seoul, the first call of the enlarged joint Asia-Australia service operated by OCCL, Cosco and ANL, which upgraded its vessel sizes from 5,500-6,000 teu to 8,000-8,900 teu following successful berthing trials at the port. “The vessel’s arrival signals Melbourne’s growing ability to match the performance of its peers, Sydney and Brisbane, to accept the larger capacity vessels now being introduced into key Australian container trades,” said VICT. The call saw around 3,400 containers exchanged, with crane productivity at around 70 moves an hour, according to VICT chief executive Anders Dommestrup. He told The Loadstar the arrival of larger vessels at Melbourne could also change the existing pattern of the Australia’s container trades. “I think the ability to ensure space for both full and empties with larger vessels will benefit Melbourne, as in recent times both empties and some exports shifted to Sydney as Melbourne became too congested. That is changing as capacity is introduced in Melbourne. “That being said, the overlap volumes are probably 150,000-200,000 teu,” he added. Prior to the completion of VICT, located in the port’s Webb Dock, vessels calling at Melbourne’s DP World and Patrick terminals in the Swanson Dock had been limited to a length of less than 320 metres, a beam of 42.8 metres and a maximum air draught of 50 metres, with navigation at night further limited. Previously, the largest vessel to call at Melbourne was the 306-metre, 6,500 teu Al Kharj – the OOCL Seoul is 322.97 metres long and has a beam of 42.8 metres, and the port will now allow vessels of up 335 metres in length and maximum beam of 45.6 metres. The larger vessel sizes appear necessary to cater for strong demand growth on the Asia-Australia trade. Container Trade Statistics (CTS) recorded a total of 1.34m teu shipped on the southbound leg in the first half of 2018, representing an 8% increase over the first half of 2017. In a research note published today, Drewry Maritime Advisors says growth rates are likely to climb higher in the second half on the year, in comparison with a poor 2017. “The second half of the year tends to bring more volumes than the first, although it was less obvious last year when demand growth was most often non-existent in the final months. “As such, the rolling 12-month average will move higher up the chart if the current momentum continues and as the last few months of last year are removed from the equation,” it said. It said it was North Chinese exports driving the growth. “The primary driver of the demand rally has been exports from North Asia, which despite some monthly Chinese New Year-related fluctuations grew by 9.5% in the first half. Exports from this sub-region of Asia dominate the trade to Australasia, accounting for approximately 70% of the total trade. “Volumes from the smaller South-east Asia origin market still posted healthy growth of 4% in the first half to reach nearly 400,000 teu,” it added. Besides the enlarged Cosco/OOCL/ANL service, last month also saw the entry of South Korea’s HMM to the trade, after it launched its North East Asia-Australia (A1X) loop in conjunction with APL and Evergreen. The service has a port rotation of Ningbo-Shanghai-Yantian-Sydney-Melbourne-Brisbane-Ningbo and is due to make its first call at VICT on 7 September, when the 5,060 teu MP The Edelman is scheduled to arrive.